Veggies are a great way to fill the belly at mealtimes and in between. Finding new ways to incorporate vegetables into your diet (and the diet of your loved ones!) can be tricky. Today I have two version of roaster cauliflower for you. I will be the first to admit I am NOT a fan of cauliflower. I avoid the “California” mixed veggies with broccoli, carrots, and cauliflower. I ignore it on salad bars. I pick around it on veggie trays. But as with most vegetables, roasting them brings out a delicious flavor that makes even one of my lesser favorite veggies pretty darn tasty. Cauli lovers will want to check this out for sure. ½ tsp spice/herb seasoning – use whatever you like! Preheat oven to 350. Mix together oil, yeast, and seasonings. Add cauli and toss. Spread on a foil-lined sheet and bake for 40 min, flipping halfway thru the cooking time. Makes one big veggie/fat serving – if you make into multiple servings or drizzle oil and use less, you can count as just veggie. In the picture you see I tried two ideas with the same head of cauliflower. 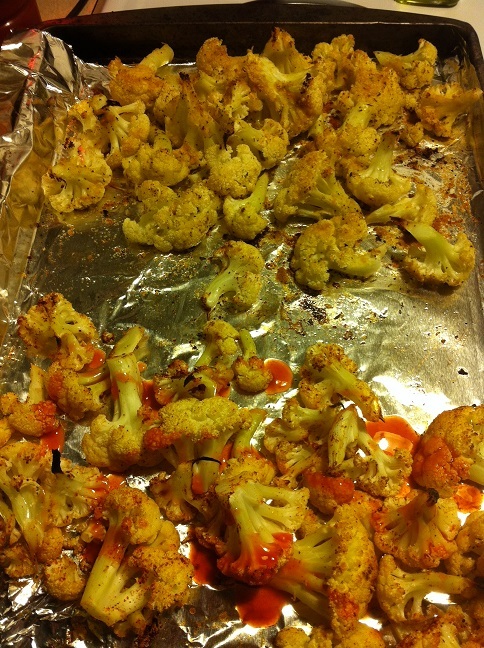 I seasoned the whole head the same them use the nutritional yeast on the top half of the sheet and drizzled Frank’s hot sauce on the other half…because EVERYTHING is better when spicy! Let recipes I post or that you find inspire you to try something new. Everything can be a starting point to put your own unique spin on it. Feast cheesy or feast spicy, but as always…FEAST ON!! !